Oatmeal Waffles - Do You Know The Muffin Man? Notes: I put the oat bran and oatmeal through the food processor because I don't like big flakes of oatmeal. This batter was thick to start with and became thicker as the oats absorbed the liquid. The flavour definitely tastes like oatmeal with its characteristic chewiness too. Not the tastiest waffles but a nice change. 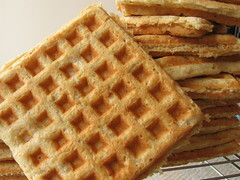 A double batch made 20 regular-sized waffles.